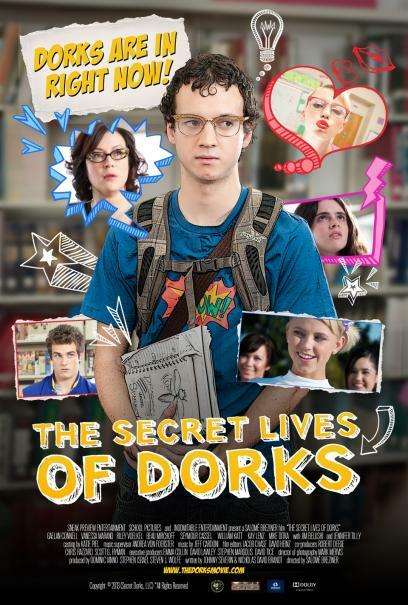 In "The Secret Lives of Dorks," Payton (Gaelan Connell) is a pathetic dork, a comic book geek whose high school career is one hopeless faux pas after another. Yet he's a dreamer and madly in love with the head cheerleader Carrie (Riley Voelkel), who he is determined to win over. But she is wise to his desperate advances, so to get off his radar she creates a plan to push him into the arms of a dorkette at the school, Samantha (Vanessa Marano). In this high school equation: Peyton wants Carrie; Carrie wants Peyton to instead hook up with Samantha; Samantha wants Peyton. But even the simplest formula can equal disaster when a cheerleader tries to play matchmaker to a dork and a dorkette. After a chance encounter with Carrie's football player boyfriend Clark (Beau Mirchoff), Payton is brought into their social circle and doesn't really care about their motives; he's just happy to be near Carrie. She tries to improve his social skills in order to ask Samantha out and her plan just might work, but this is Payton we're talking about. With adult wisdom imparted by the likes of Payton's dad (Jim Belushi), his teacher (Jennifer Tilly), and NFL Hall of Famer Mike Ditka, who offers his own brand of "Ditka On…" self-help lessons, Payton’s life shifts into high gear from lonely misery to utter disaster.